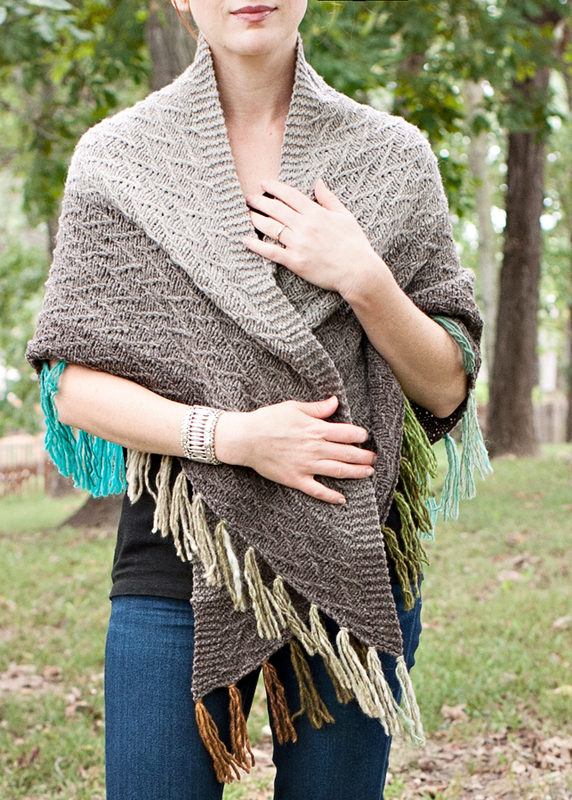 A generously sized, cozy shawl with slipped stitch texture in three colors, and an optional fringed hem. Purchase both the Western Auto Cowl and shawl patterns and receive a $2 discount! No code needed and purchases do not have to be made at the same time, the discount will be automatically applied any time the second pattern in the set is purchased. Pattern is written for one size with notes on adjusting for a smaller or larger shawl. YARN: 750 yards (686 m) of worsted or aran weight yarn divided as follows: C1 - 250 yds (230 m), C2 - 300 yds (274 m), C3 - 200 yds (182 m) plus an additional 60 yds (55 m) for optional fringe. Sample shown in Blackberry Ridge Merino Medium Weight 2-ply (100% wool; 250 yards / 4 oz) in 10% Gray (C1), 20% Gray (C2), and 40% Gray (C3) with fringe in Noro Kureyon (100% Wool; 110 yards / 50 grams) in colorway #164. NEEDLES: 36” (or longer) circular needle in US 9 (5.5 mm) OR size required to obtain gauge.